These are really simple to make, just perfect for a dinner on a Tuesday or any other day when you are a bit tired. Fast, easy and not too expensive. I used fish and prawns from the freezer, fresh probably work just as good (or maybe even better!). But then again, it was a lazy Tuesday after all. I just didn’t feel like going to the shop. Cut the fish in smaller pieces and add to your mixer. Add the rest of the ingredients and let the knife in the mixer do its work. You might have to scrape the edges with a spatula to be able to mix everything to an equal paste. Let the batter rest for 5 minutes in the bowl so that the chia seeds can swell and help the batter keep together. Wet your hands with water and shape 6 fish cakes. Don’t make them too big or they can break during the baking! Bake the fish cakes for about 10 minutes on low heat in deodorized coconut oil. Turn them every now and then. 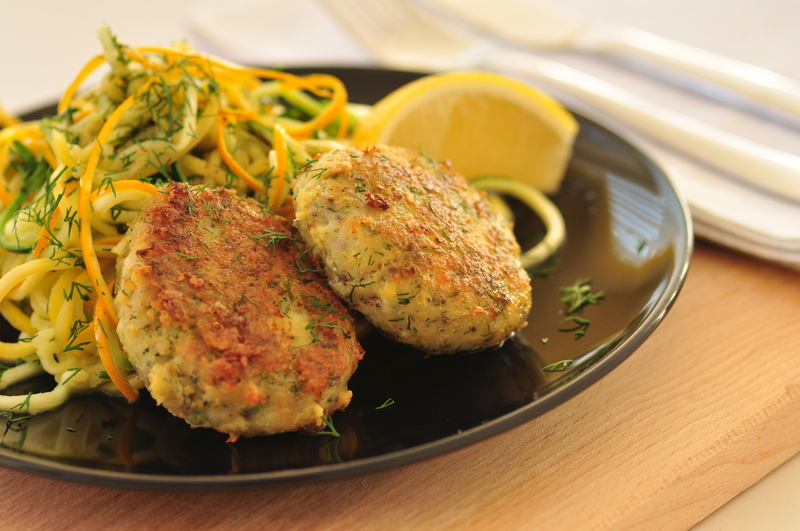 The fish cakes are really good with spiralized zucchini baked with lemon zest and dill. Find the recipe here!